The latter stages of chronic bronchitis and emphysema are characterized by the development of respiratory failure. For practical purposes this is said to occur when there is either a Pa02 of less than 8 kPa (60 mmHg) or a Pac02 of more than 7 kPa (55 mmHg). The persistence of chronic alveolar hypoxia and hypercapnia leads to constriction of the pulmonary arterioles and subsequent pulmonary arterial hypertension. 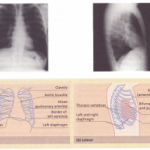 Patients may develop cor pulmonale, which is defined as heart disease secondary to disease of the lung. It is characterized by pulmonary hypertension, right ventricular hypertrophy, and eventually right heart failure. On examination, the patient is centrally cyanosed (owing to the lung disease) and, when heart failure develops, breathlessness and ankle oedema occur. Initially a prominent parasternal heave may be felt due to right ‘ ventricular hypertrophy and a loud pulmonary second sound may be heard. In very severe pulmonary hypertension there is incompetence of the pulmonary valve. With right heart failure, tricuspid incompetence may develop with a greatly elevated jugular venous pressure OVp), ascites and upper abdominal discomfort due to swelling of the liver. This is usually clinical. 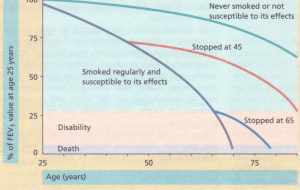 There is a history of breathlessness and sputum production in a lifetime smoker. 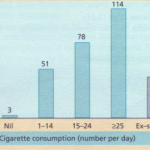 It is unwise to make a diagnosis of chronic bronchitis and emphysema in the absence of cigarette smoking unless there is a family history of lung disease suggestive of a deficiency of ai-antitrypsin. 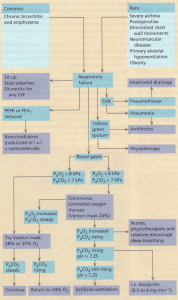 In clinical practice, emphysema is often incorrectly diagnosed on signs of overinflation of the lungs (e.g. 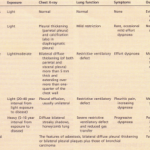 loss of liver dullness on percussion), since this may occur with other diseases such as asthma. Furthermore, centri-acinar emphysema may be present without signs of overinflation. Some elderly men develop a barrel-shaped chest due to osteoporosis of the spine and a consequent decrease in height. This should not be attributed to emphysema. In a number of patients the airflow limitation is reversible and the distinction between asthma and chronic bronchitis and emphysema can be difficult. ON CHEST X-RAY the diagnosis of chronic bronchitis and emphysema is not always possible as the chest Xray can be normal, even when the disease is advanced. The classic features are the presence of bullae, severe overinflation of the lungs with low, flattened diaphragms, and a large retrosternal air space on the lateral film. There may also be a deficiency of blood vessels in the peripheral half of the lung fields compared with relatively easily visible proximal vessels. THE HAEMOGLOBIN LEVELAND PCV maybe elevated. BLOOD GASES are often normal. In the advanced case there is evidence of hypoxaemia and hypercapnia. SPUTUM EXAMINATION is unnecessary in the ordinary case as Strep. pneumoniae or H. influenzae are the only common organisms to produce acute exacerbations. Occasionally Moraxella catarrhalis may be the causative bacterium. ELECTROCARDIOGRAM. In cor pulmonale the P wave is taller (P pulmonale) and there may be right bundle branch block (RSR’ complex) and the changes of right ventricular hypertrophy. ai-ANTITRYPSIN. Measurement of serum ai-antitrypsin levels (normal range 20-48 rnmol litre “). BRONCHODILATORS. Many patients feel less breathless following the inhalation of a f3-adrenoceptor agonist such as salbutamol (200 f.Lg4-6-hourly). More prolonged and greater bronchodilatation results from the use of the anticholinergic agents ipratropiurn bromide 40 f.Lgfour times daily or oxitropium bromide 200 f.Lgtwice daily. Objective evidence of improvement in the peak flow or FEVI may be small, but with severe disability it may be of considerable help. 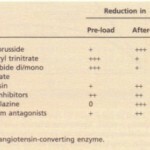 Long-acting preparations of theophylline are of little benefit. 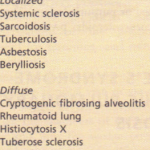 CORTICOSTEROIDS. In symptomatic patients with chronic bronchitis and emphysema, a trial of corticosteroids is always indicated, since a proportion of patients have a large, unsuspected, reversible element to their disease and airway function may improve considerably. Prednisolone 30 mg daily should be given for 2 weeks, with measurements of lung function before and after the treatment period. If there is objective evidence of a substantial degree of improvement in airflow limitation (>15%), prednisolone should be gradually reduced and replaced by inhaled corticosteroids (beclomethasone 100- 500 f.Lgthree times daily). The long-term value of regular inhaled corticosteroids in all patients with chronic bronchitis and emphysema awaits evaluation. ANTI BlOTI CS. Prompt antibiotic treatment shortens exacerbations and should always be given in acute episodes as they may prevent subsequent further lung damage. Patients can be given a supply of antibiotics to keep at home to start as soon as their sputum turns yellow or green. Arnoxycillin-resistant H. influenzae has become an increasing problem, occurring in 10-20% of isolates from sputum. Resistance to cefaclor 250 mg 8-hourly is significantly less frequent and it has become the antibiotic of choice. Long-term treatment with antibiotics remains controversial. They were once thought to be of no value, but eradication of infection and keeping the lower respiratory tract free of bacteria may help to prevent deterioration in lung function. DIURETIC THERAPY. This is necessary for all oedematose patients. al-ANTITRYPSIN REPLACEMENT. Weekly or monthly infusions of a,-antitrypsin has been recommended for patients with levels of this compound below 11 mol litre-‘ (310 mg litre “) and abnormal lung function. Whether this modifies the long-term progression of the disease has still to be determined. MUCOLYTICS AND VACCINES. There is little evidence that mucolytics are of any benefit, though it is vital that patients are encouraged to cough up sputum, initially with the help of a physiotherapist. Symptomatic treatment with steam inhalations may help to liquefy the sputum so that it can be more easily coughed up. Influenza vaccines should be given yearly to patients with disabling chronic bronchitis and emphysema.